For Christmas I decided I wanted a new piece of luggage to take on our Disney World Vacation. Mike & I have always shared a suitcase which has really limited us on how much we could pack (and how many new purchases we could make while we were on vacation!). 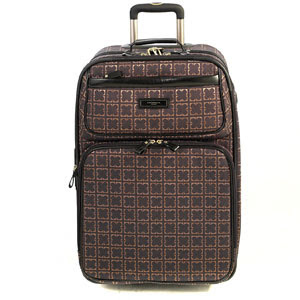 I found a really HUGE Liz Claiborne suitcase at our local Burke's Outlet that I love!! It's 29" with lot's of room for souvenirs, the color is a little off on the picture below, mine is dark and light gray with an extending handle and wheels. It would weigh a ton if you filled it to the max. It's going be great to have it all to myself. I can't wait until it's time to start packing!! I swear, if Lexi weren't going to be in Korea when we were going I could hide her in there and PawPaw Mike would never know until we got there. I guess I am just going to have to buy lots of princess stuff and send it to her ;). Now I am just going to have to go shopping to buy myself some new clothes to fill it up before we leave. A girl's gotta look good while she's on vacation, you never know when you're going to bump into Mickey or Prince Charming.